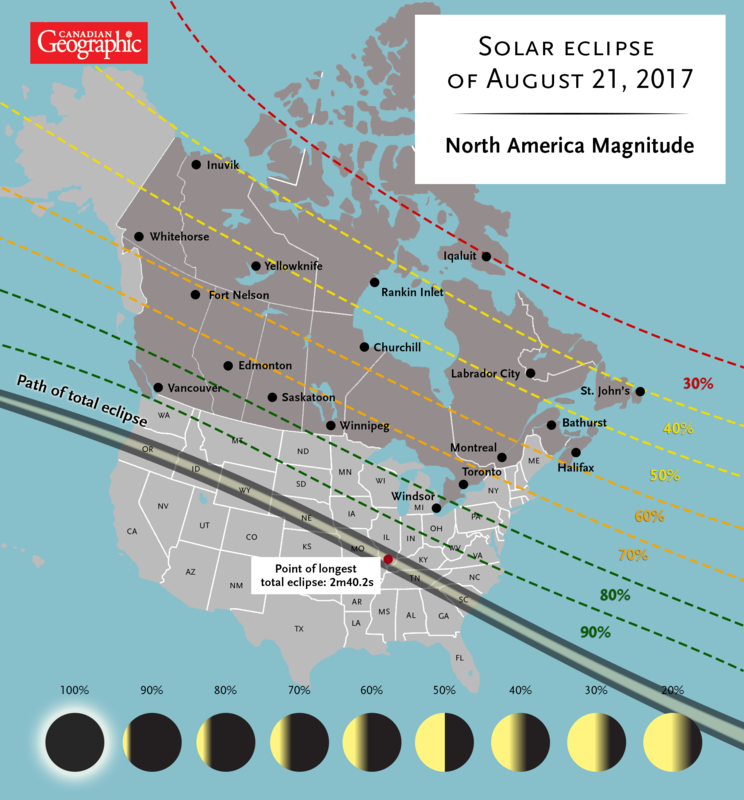 Here's how Canadians can watch the so-called "Great American Eclipse"
North America will witness a total solar eclipse today, but some corners of the continent will have a better view of the natural phenomenon than others. Sadly for Canadians, the path of totality — where the sun will be completely eclipsed by the moon's shadow for a couple of minutes — lies well to the south of us, passing through Oregon, Idaho, Wyoming, Nebraska, Missouri, Illinois, Kentucky, Tennessee, and South Carolina. It's the first time since 1918 that a visible total eclipse will cross the entire United States, from coast to coast, so cities and towns along the path of totality are preparing for an onslaught of tourists, but if you don't have the time or the budget to get yourself to Casper, Wyo., Idaho Falls, Idaho, or Nashville, Tenn., and still want to see the celestial event in all its spooky glory, you're in luck. The eclipse will begin over the Pacific Ocean at 15:46 UTC, which corresponds to 8:46 a.m. PDT, 9:46 a.m. MDT, 10:46 a.m. CDT and so on. To make the most of your viewing experience, check out a public viewing event taking place near you; many of these events will have experts, telescopes and protective eyewear on hand. Remember: never look at the sun without proper protective eyewear, and use an appropriate filter if looking through a telescope. Special solar viewing glasses can be purchased from the Royal Astronomical Society of Canada's e-store.